The Louisville Manufactured Housing Show was held this week, and hundreds of manufactured housing buyers attended the event that had 48 homes showcasing what's new in home design. It motivated me to revisit the homes that Lifestylist Design had merchandised for Patriot Homes over the years and I came across this one. It's the perfect example of timeless design, or even deign ahead of it's time. Drapery panels instead of fussy valances? Yes. High flat ceilings? Yes again. Soft muted colors accented by fabrics and accessories? Exactly what we are seeing today. Believe it or not, this was a home that was shown 8 years ago! This is a perfect example why great design will never go out of style. When looking for your new home look for ideas that aren't trendy but are something you want to live with for a long time. 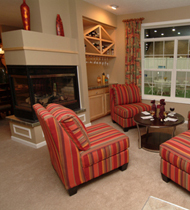 By adding color in items that can easily be replaced like fabric, furniture and accessories you'll always be in style.